Buildings consume about 40 percent of the energy used in the United States, more than either the manufacturing or transportation sectors. Not surprising, projected future growth in energy demand is expected to come primarily from buildings. This means our biggest opportunity to substantively reduce carbon emissions will come from designing buildings that use less energy. The Greenfire Campus addresses this challenge with two buildings that use dramatically less energy than your typical “business as usual” project in Seattle. At Greenfire, the apartment building is anticipated to use 42 percent less energy than a comparable building and meet the LEED platinum energy reduction target. The office/retail building anticipates a 70 percent reduction in energy use compared to a typical building, exceeding the current carbon reduction target set by the Architecture 2030 Challenge. Solar power further reduces energy that would otherwise be purchased by as much as 5 percent. For WSP, the principle of “sensible sustainability” provided a guiding hand for setting energy reduction targets. An early decision to achieve a LEED platinum certification helped provide the direction, but this project looks beyond LEED and seeks to demonstrate strategies that can be adopted by others who want to reduce energy consumption and test the idea of sustainability in the context of long-term ownership and reasonable construction costs. The office building has a 10-kilowatt solar power system on the roof. We started with the basics. The most energy-efficient buildings are those that need very little heating and cooling. In Seattle, most of our buildings require heat almost year-round. For Greenfire, we are providing super-insulated buildings to reduce the heating needed as a fundamental load-reduction strategy. In addition, the project takes advantage of the mild Pacific Northwest climate with a natural ventilation/passive cooling system. It’s simple: open the windows on mild days and close them when it’s cold or unusually hot. Because the local climate is between 50 to 75 degrees for more than half of the occupied hours each year, fresh air introduced through windows does the trick. A system of red/green indicator lights will notify people when to close or open windows to maintain a comfortable building temperature. This is part of an integrated strategy that places an emphasis on providing connections to outdoors for building occupants. At night, fresh air will precool the building, significantly reducing fan operations and resulting in big energy savings. Additionally, exterior window shading will mitigate direct sunlight from overheating spaces. While occupant-managed natural ventilation strategies provide a healthy and comfortable indoor environment for much of the buildings’ spaces, mechanical ventilation systems are still required in areas such as restrooms. A metal plate heat exchanger will capture exhaust heat and temper incoming fresh cold outdoor air to provide healthy and comfortable spaces, recovering 75 percent of the energy that would otherwise be lost to the outdoors. As an added benefit (and opposed to most office buildings in Seattle that recirculate a portion of the air used for HVAC), 100 percent of the buildings’ air at Greenfire will be fresh outdoor air, whether delivered by an open window or a mechanical system. Another example of sensible sustainability is the effective use of daylight to help illuminate office spaces, thereby reducing the amount of energy used by artificial lighting. The lighting system is designed to beat Seattle’s energy code for installed lighting by as much as 35 percent. Occupancy sensors are used in the garages, private offices, meeting rooms, communal areas and stairs to further reduce energy use. Site lighting is strategically placed to provide safe illumination while conserving energy. Heating for Greenfire is provided by hot water generated by heat pumps that are three to four times more efficient than conventional boilers. The heat pumps are connected to a ground loop heat exchanger, a loop of flexible piping inserted into a series of buried vertical boreholes throughout the site grounds. Fluid circulated through the piping extracts heat from the ground. The number of boreholes and their depth dictate the heating capacity of the ground loop heat exchanger. To provide enough boreholes to meet the peak heating needs during the coldest day of the year would have meant very high drilling costs. So, a sensible sustainable choice was made to reduce the size of the ground loop heat exchanger and provide supplemental boilers to operate for those few hours a year when the heat pump system is not enough. The heated water is circulated in radiant floors in the apartment building to provide a highly comfortable environment on even the coldest days, and to generally enable lower thermostat settings than more traditional heating systems. The office/retail building was determined to require some cooling on the hottest summer days when passive cooling is ineffective. We designed a “high-temperature” cooling system that takes cool water generated by the heat pumps operating “in reverse” and distributes it as needed to active overhead chilled beams. An active chilled beam is essentially a radiator that cools spaces when a small amount of air is blown across it. Notwithstanding the name, an active chilled beam is also suitable for heating. While temperature control is critical in office spaces, hot water on demand is a must in residential spaces. 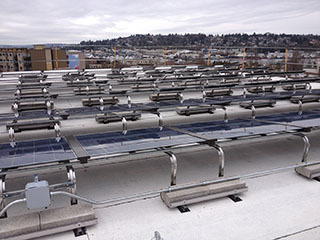 To meet this requirement with energy efficiencies, a rooftop hot water solar system generates approximately 70 percent of the domestic hot water. On warmer sunny days when excess solar heat is created, it will be routed to the common ground loop heat exchanger used by the entire campus. This will seasonally store heat in the ground that can be used the following winter. Office and retail cooling using heat pumps in the summer also provides a waste heat source that will be used to recharge the ground loop heat exchanger. To round out the renewable energy sources on the project, a 10-kilowatt solar power system has been installed on the roof of the office building. WSP is proud to have been a project partner and contributor to the Greenfire Campus. We believe it serves as an ecological learning lab that can be replicated in part or entirety to help us all save energy and conserve our natural resources. Tom Marseille, PE, Hon. AIA, LEED AP BD+C, is senior vice president and managing director of the Seattle office at WSP.